Two Brothers Brewing Company unveils two exciting pieces of news – a re-branding of their brewery's logo and label architecture that is featured on their newest artisan beer release, Wobble IPA. 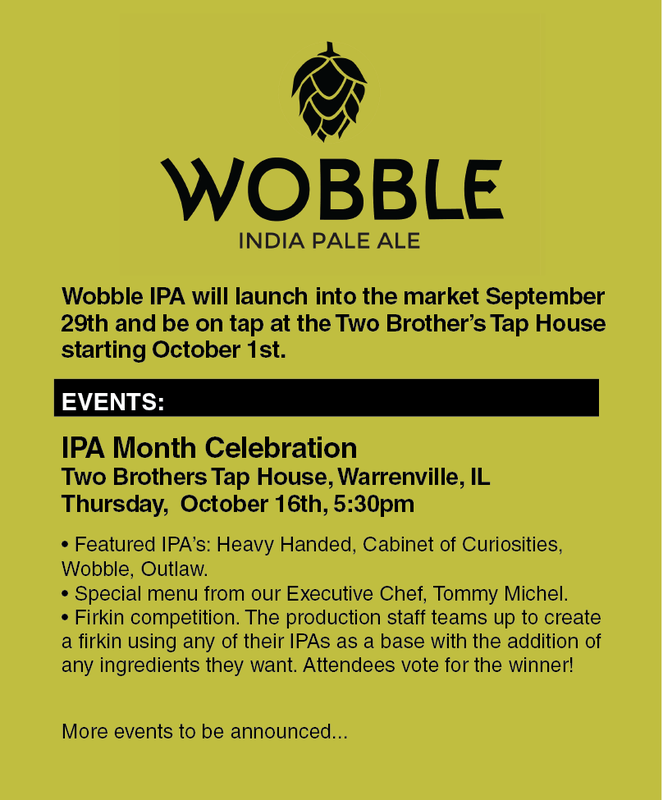 Wobble will join the portfolio as Two Brother's first year-round IPA. Golden in color with a subtle malt character, the addition of Citra, Chinook, Cascade and Centennial hops add a big complex citrus flavor with piney hop notes throughout the beer. “We are always pushing the envelope to deliver flavor-forward beers and hope to continue to innovate and introduce bold brews. After nearly 18 years in the industry, we are excited to introduce a beer that wobbles on the edge of really hoppy,” said Jason Ebel. In addition to the new beer release, Two Brothers also unveils a new look for their brand and label design, which has continued to evolve over the past 18 years. The new logo keeps the swirl icon from the previous logo, but strips out the gradients of color in a flatter, more modern interpretation. The color palette has shifted slightly more natural, reflecting the focus on quality ingredients and artisanal recipes that Two Brothers prides themselves on. The typography which previously had a more playful/quirky approach, feels more sophisticated while still revealing elements of unexpectedness in the nuances of the letters. The evolution of the Two Brothers brand. The new label design, which will roll out to the other year-round offerings over time, has abandoned the hand-drawn, illustrative style we've grown to know from Two Brothers. The modern, banded architecture focuses on the specific ingredients, characteristics and food pairings of each beer, once again emphasizing Two Brothers' passion for the marriage of food and beer created from quality ingredients. The swirl icon is a design element we've been seeing on their recent can designs, such as Sidekick and Outlaw.